Whether you were born with thin hair OR your hair is fine and damaged because of over-styling damage or other factors, you can take action to pump up the volume. Below, see 12 styling tricks, lifestyle tips and products to help plump up your fine, thin hair now! For more hair-thickening tips, see the complete post originally published in Allure. Big hair requires double the amount of volumizers. Start by prepping damp hair from roots to ends with a volumizing spray and a lightweight mousse, suggests hairstylist Nunzio Saviano, owner of Nunzio Saviano Salon in New York City. Or apply Viviscal’s lightweight leave-in serum, the Gorgeous Growth Densifying Elixir, to add volume to wet or dry hair. To add ultimate volume, flip your head upside down and tousle your hair while you blow-dry, says hairstylist Garren of the Garren New York salon. If you’re using an ionic blow-dryer, turn off the ionic setting. Ions make your hair sleek but can also kill volume. 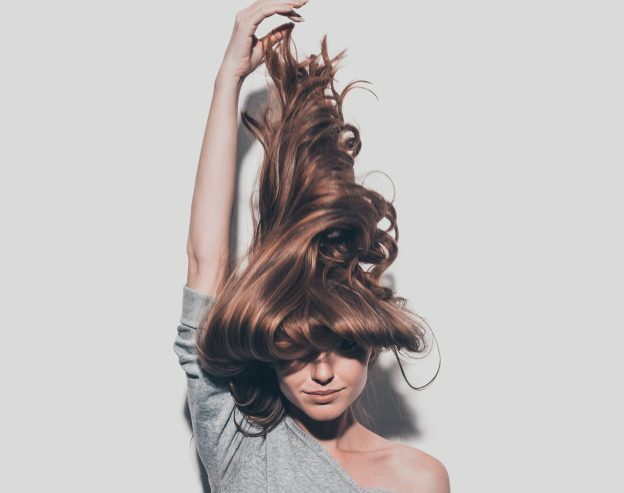 After drying your hair upside down, flip your head back up and then use your blow-dryer and a big round brush to smooth hair while adding body. Use medium heat — hot air damages hair cuticles, making them lie flatter — and only use wood or cork-core brushes. Metal actually can scorch fine hair (yikes). Repeat the upside-down, flip-up routine again. On day two, flip your head over and mist your dry hair roots with a light-hold hairspray. Then wait about 30 seconds before you turn right-side up to allow the hairspray to dry. Did you know that hair shedding is at its highest in early fall? “It’s evolutionary,” says New York City dermatologist Francesca Fusco of Wexler Dermatology. “The scalp holds onto hair during the summer as a protection from UV — the shedding occurs about three months later.” No matter what time of the year, be sure to cleanse and exfoliate your scalp regularly. Use a shampoo and conditioner specifically meant to thicken hair in order to increase volume, such as Viviscal’s Gorgeous Growth Densifying Shampoo and Conditioner. Avoid washing your hair every day as that can strip away hair’s natural oils. Instead, go for a dry shampoo, such as Batiste. “Of all the oils, it turns out that coconut oil is the most effective at reducing protein loss (and subsequent thinning) of hair,” says Dr. Fusco. Coconut oil is full of fatty acids that penetrate the hair shaft, smoothing and conditioning strands. Add a few drops to your regular shampoo or add it in a DIY deep-conditioning mask. Hairstylist Matt Fugate notes that short, blunt haircuts can minimize the look of thin strands. These cuts give hair the look of more body and they are super-easy to style. “If you want to go deeper into knowing what is causing your thinning hair, visit a trichologist to see what nutrients and vitamins your scalp is lacking,” says Yepez. Yepez says many of her clients see Dr. Ricardo Vila Nova to help restore and revitalize hair. Yes, heat tools like blow-dryers, flat irons and curling wands are the best when it comes to styling. But overdoing it with heat tools can cause major breakage. Give your hair a breather every once in a while. And use a restoring deep conditioning treatment to strengthen strands, fix split ends, and even minimize breakage to allow hair to grow longer. Stress is one of the biggest factors of hair thinning, according to Fugate. Keep your cool by getting enough sleep, following a balanced diet and getting regular exercise. Yes, you know these tips are important to your health, but it’s a good reminder that they can also affect your hair. So take a deep breath and relax, for your health and your hair.